What would you do if you received an invite to meet your ultimate crush? That someone you have been adoring since you were 3? Of course you will go. So I did go - never mind that I only have 2 hours of sleep. I couldn't miss this chance. One thing I notice about Bossing Vic Sotto - he loves Lacoste shirts! We were invited to the Bloggers Merienda with Bossing Vic Sotto last Tuesday in Cravings, Katipunan (I remember the old, rustic Cravings!) . I felt like dreaming when I read the message. I have to re-read and re-read the message. I took note of the date. It's the first time he's doing it. I cannot even remember that bossing actually sit-down with press people - well, mostly are press conferences with other stars of the film. This one though, is an intimate event. We were all very excited waiting for him. We were like on a dating game - retouching our make-up, re-applying lipstick and practicing smiles. As soon as he arrived, the cameras started clicking. Enteng ng Ina Mo is his newest film, and an entry to the Metro Manila Film Festival. When he is finally seated, he asked for a cup of coffee - and the first question was thrown. Someone asked how did the team come up with such an idea of pairing up with Ina Montecillo. He said he got the inspiration when Ai Ai made her speech last year after winning an award (was it box-office queen?! cannot remember..). The one that caught his interest was Ai Ai's lines - "kulang na lang maging asawa ko si Bossing Vic Sotto!". So will they get married in the movie? That's for us to find out. Bossing Vic shared with pride that it was the writer, Danno Kristoper C. Mariquit (screenplay) who brilliantly combined the world of Enteng Kabisote and Ina Montecillo. How would you combine fantasy and reality? without losing the characters' individuality or stealing one's spotlight in the movie? They have such a great team. Bossing Vic also shared that one thing that is common to the two are their love for their families. Thinking of Bossing - the Prince of Comedy, and Ai Ai - Queen of Comedy in a movie - it's going to be a riot. But Bossing said that the best moments he enjoyed during the 30 plus days of shoot were the off-shoot moments - when lights are out, the film is not rolling, and everyone is being themselves. Bossing Vic adores Ai Ai's sense of humor and wit. He loved the spoof moments, specifically the John Lloyd and Sarah scenes - the one in the bathroom is a classic. It took several shots to be finished because they couldn't take serious shots without laughing at each other! During the event, it was announced that the movie, Enteng ng Ina Mo is Graded B and is rated General Patronage by the MTRCB. I couldn't take my eyes off him. He's such a beautiful man! I was seated so close to him and I could say, I can reach the star. He's as witty as I see him on TV - he even brought his funny antics - Mwah, Mwah, Tsup, Tsup! (seems like everyone one of us wanted such experience!). He is articulate and he talks with sense. When the interview was done, and when the host announced that Bossing has to go, we (bloggers) had gone crazy - flocked around him to get a picture taken with him. Just to get near him and share a frame with him is enough. I wish we were all given the chance to have our pic taken with him just like with other Bloggers event with celebrities. It wouldn't take 15 minutes. I was lucky to have my pic taken with him. We posed side by side for a few seconds (his hand on the small of my back!) because my friend's camera didn't seem to work. I was in nirvana! It felt like winning a jackpot in Pinoy Henyo! So now, we will be watching two movies on the 25th! For the first time, I am excited about Christmas break! “Enteng Ng Ina Mo” casts are Marvin Agustin, Oyo Sotto, Carlo Aquino, Alwyn Uytingco, Nikki Valdez, Aiza Seguerra, Bing Loyzaga, Amy Perez, Gwen Zamora, Ruby Rodriguez, Jose Manalo, Wally Bayola, Xyriel Manabat and with the Special Participation of Eugene Domingo. 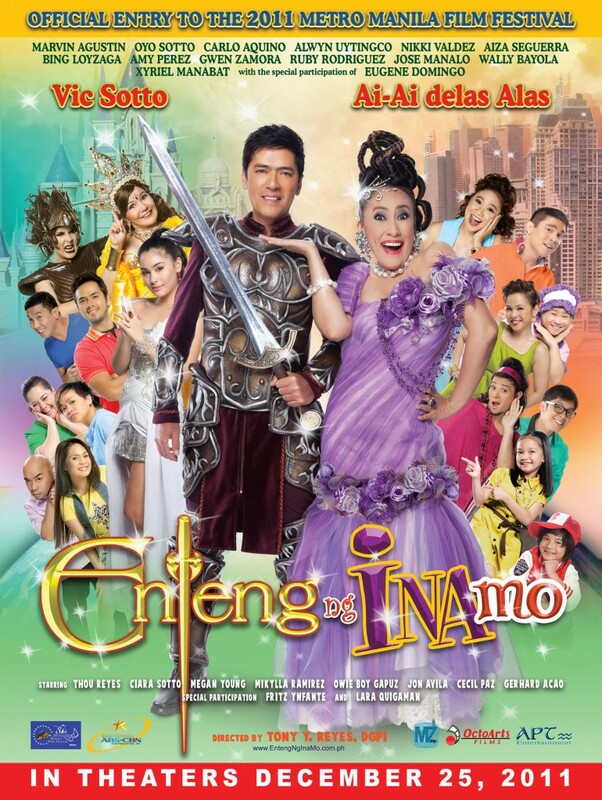 “Enteng Ng Ina Mo” is a joint production by Star Cinema, M-Zet TV Productions, APT Entertainment Production and Octo Arts Films and is a cross-over to the Ang Tanging Ina and Enteng Kabisote series. Starring Vic Sotto and Ai-Ai delas Alas. Written by Danno Kristoper C. Mariquit and Directed by Tony Y. Reyes, DGPI. Want more of Bossing? See more of events pictures here.